Do you know the names of top Channel Partner sales reps? Met them? Home → Uncategorized → Do you know the names of top Channel Partner sales reps? 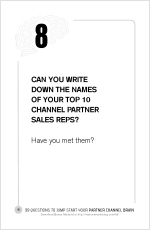 Do you know the names of your top Channel Partner sales reps? Relationships matter. When there’s a bond and common purpose, you can move mountains… or change the modern-day calendar as twelve guys did two millennia ago. Or let me pose the question a different way. If your goal was to increase channel revenue by 30% in the next twelve months, how many cloned-copies of your #1 Channel Partner sales rep would you need? I bet it’s a surprising small number. No doubt, keeping these people top-of-mind is important… that is, if you know who they are. 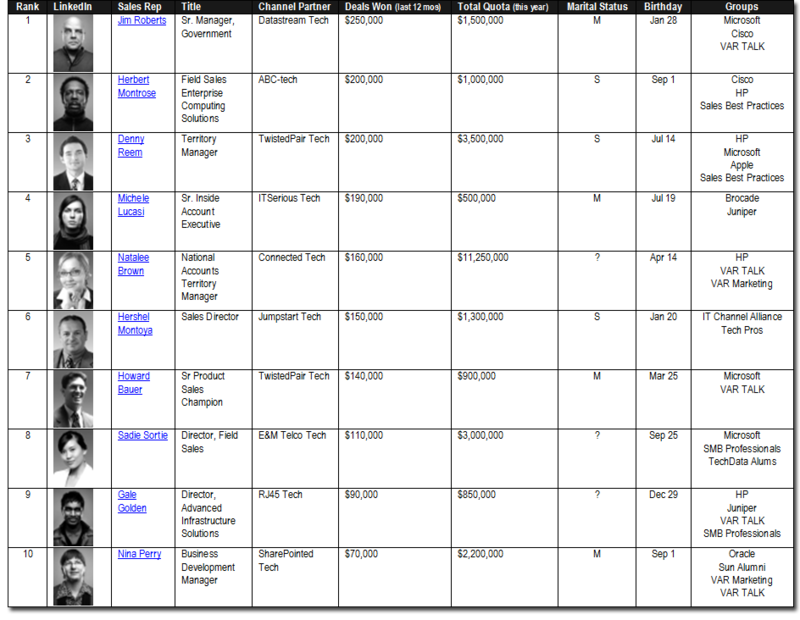 Who “owns” YOUR Channel Partner sales rep relationships? A few years ago I was called in to help a CEO work through a really tough situation. Two of his sales reps had resigned abruptly. As we worked through the issues, my main concern about protecting his end-customers from pilfering by these two reps wasn’t too much of a concern. He had non-compete agreements in place with his sales reps and his attorney was quick on the draw to remind these two of their contractual obligations. Score 1 for thinking ahead. However, he did have another problem. All his revenue came through Channel Partners—managed solely by sales reps like the two who had just walked out. Besides these two departed employees, no one else in his company had a relationship with the Channel sales reps. Sure, there was a CRM record with the names, but that was it. Besides getting his Xanax prescription refilled, my client needed to get busy shoring up some long-ignored, but important, relationships. LinkedIn became our principle tool. We looked for ways to introduce other support team members to our Channel Partners, and at the appropriate time (say, after a webinar), request LinkedIn connections. And by the way, this included the CEO, too. If he was on the call, he also sent a LinkedIn request. We had a leaderboard mounted in the sales area with the names of our monthly Top-10 Channel sales reps. At our weekly sales meetings we got a current snapshot from A/R along with some simple trend data. Example Leaderboard: Once you’re connected on LinkedIn, all the data is readily available. Notice the common groups—a great indicator where your company needs to show up. Of course, this is just a start. Add fields that are important to you. And don’t forget to celebrate birthdays! Since we were only tracking ten people, the burden was tiny. And after a while, it added a new dimension to our business relationships. I suppose you could say we were stalking our Channel sales reps… and to a certain degree we were.